Enjoy a walk on part of the MILLENNIUM WAY. 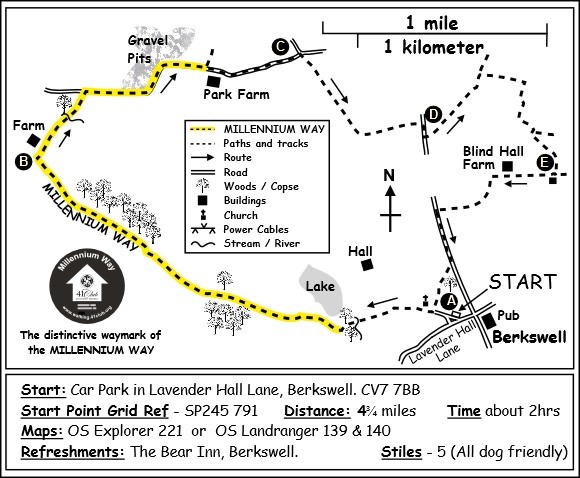 Almost half of this delightful walk uses a section of the long distance trail known as the MILLENNIUM WAY (clearly waymarked with the distinctive black Millennium Way circular waymarkers). All the stiles are dog friendly. Find out more about the walk by clicking on the information icon. Starting from the car park in Lavender Hall Lane turn right out of the car park then up Church Lane towards the attractive 12th century Norman church of St.John Baptist. The village of Berkswell takes its name from Bercul, a Saxon landowner and the 16 ft square stone-walled well on the left near to the church is said to have been used for baptisms by immersion. Continue ahead through the churchyard ( past the church, keeping high wall on your left ) to take a metal gate, then through a small wood with gates at either end and on to a long section of boarded walkway through a field, with views of Berkswell Hall ( built c.1815 ) to your right. Cross the bridge over a stream, continue to a kissing gate and turn immediately right, to join the Millennium Way with its distinctive black and white waymark signs. Pass through a small wood to follow the well defined path up the field heading for corner kissing gate at edge of wood. You have lovely views of the lake & hall to your right. Go through the kissing gate at the top corner of the field into a small wood, continuing through fields keeping the hedge to your right, the path eventually passing by a wood on your right to arrive at a wooden kissing gate. Take the kissing gate then turn right and follow edge of field with hedge to your right for 200 paces to take another kissing gate into the wood. Turn right then immediately left along edge of wood keeping to right of pond. Continue ahead along the attractive woodland path and over wooden stile keeping hedge to left. As path approaches the farm turn right at gatepost and go with high broken hedge on left. Head gently downhill and go through kissing gate in corner of field, and ahead crossing bridge over stream and then through metal gate. Head across field towards stile. Go over stile, and turn left along path following wire fence and quarry works on right. Take gap next to large metal gate to go right along surfaced track.Continue along surfaced track and after approximately half a mile, during which the surfaced track changes direction a couple of times, go through gate adjacent to metal gate and after a little while you will come to a metal gate–in –gate on your left just before the drive to a farm house (Park Farm). Ignore this gate as this is the point where you leave the Millennium Way. Instead, continue ahead on the surfaced track, past the drive to Park Farm until you reach a road junction. At this junction take a kissing gate in the right hedge. Go ahead across the field to a gap in the hedge. Go through the gap and continue straight ahead across the field taking the stile in the far left corner. Keep ahead with hedge right crossing over next stile then through a metal gate to reach the road. Turn right onto road and after a few paces proceed through kissing gate on the left by the side of a double metal farm gate, continuing directly across field to pass under power cables in far corner, then crossing stile to turn left, keeping to the edge of field with hedge left, ignore kissing gate in first corner but continue around field edge, skirting wooded island with a pond, up the field to top left corner, then right for about 60 paces and take a hedge gap left by marker post. Then go right with hedge right to pass under power lines. Continue ahead to take corner gap in hedge turning left, keeping hedge left, along edge of field. Keeping to the left of a small lake go through wooden kissing gate and continue ahead over small wooden bridge turning sharp right to reach, after 10 paces, a junction of paths. Ignore path straight ahead and take the right hand path to follow around edge of field keeping close to hedge right. Stay with hedge right to eventually reach kissing gate on right. Take kissing gate to join the Heart of England Way. Continue along the track past Blind Hall Farm, pass through a kissing gate adjacent to cattle grid, and stay along track until you reach the main road. Turn left for approx 300yds. Just before the houses take the footpath on the opposite side of the road, through kissing gate and go forward through second kissing gate and along path with fence right to go through two further kissing gates, eventually reaching Berkswell Church. Exit churchyard, and turn left along Church Lane which will bring you back to the Car Park. An interesting village with a lot of history. For detailed notes on the features and history of the village, see the ‘points of interest’ notes for East from Berkswell. A 19th century country house, now converted into residential apartments. 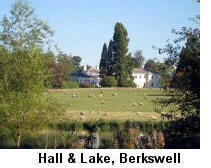 A late C16 or early C17 grade II listed former farm, owned by the Berkswell Estate. 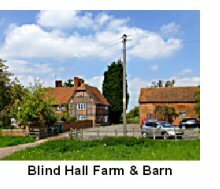 The nearby barn is also listed, dating from 1735. The house is reputed to be haunted! The Bear Inn at the end of the walk dates from the 16th century, and has an interesting interior, but is part of the Chef and Brewer chain. However, recent diners (March 2013) have reported good experiences.